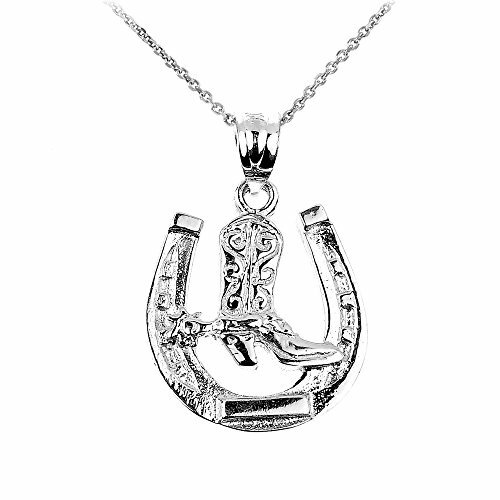 925 Sterling Silver Lucky Horseshoe with Cowboy Boot Charm Pendant Necklace, 20"
In many cultures around the world, a horsehoe, kept as a talisman, is seen as a good luck charm. And the horse is usually represents as the carrier of good things. It is also one of the twelve animals of the Chinese zodiac and symbolizes speed, power and perseverance. This horseshoe with cowboy boot charm pendant necklace will be a great gift for someone who was born in the year of the horse or any horse-lover in general. If you have any questions about this product by Horseshoe Jewelry, contact us by completing and submitting the form below. If you are looking for a specif part number, please include it with your message.